This is the third of four keys to making effective use of a moisture meter. Even properly taken readings are subject to factors inherent in the design of the meter. Pin meters are affected by temperature. They will overestimate the moisture content (MC) in a hot environment (wood temperature), and underestimate it in the cold. This will probably only be significant in a cold lumberyard where the meter will read perhaps 1-3 points less than the actual MC. Consult the table that comes with the meter. The species of wood also affects pin meters but, in the MC ranges we are typically measuring in the wood shop, there is little difference among most species, in the range of one or two points. Measuring boards of one species in a consistent environment will cancel any significance of these two factors. Surprisingly, wood density is an unimportant factor. Measuring with the grain, versus across it, is a slight, but generally insignificant factor. Of course, wet spots on the wood (such as melted snow) will greatly distort the readings. In summary, for pin meters, there are not too many factors to be greatly concerned about. The main issue is to be aware of the depth into the thickness of the board at which the meter is measuring, and be aware of the possibility of a moisture gradient, especially in thick stock. Remember too, the meter measures the wettest layer between the probes. This is usually the deepest point of penetration by the probes if the wood is still in the initial drying process, though not if it is rapidly gaining moisture. And, of course, they make holes in your wood! Pinless meters are significantly affected by wood species, density, and, as addressed in the previous post, surface quality. The “species” is really just a proxy for density, and this can be confusing. The tables or programmable functions that accompany the meter are necessarily based on average density values for a given species. However, because each tree is unique, the densities of different samples of a species can vary greatly. The manufacturer supplies a formula to calculate your own correction factor, but it requires an accurate measurement of the specific gravity (density) of the sample of wood in question, which is usually rather impractical, especially when you do not already know how much of the measured weight is water. Furthermore, when assessing newly acquired wood, referencing boards of same species on the racks in your shop, fully equilibrated, is not necessarily helpful since they may be quite different in density. 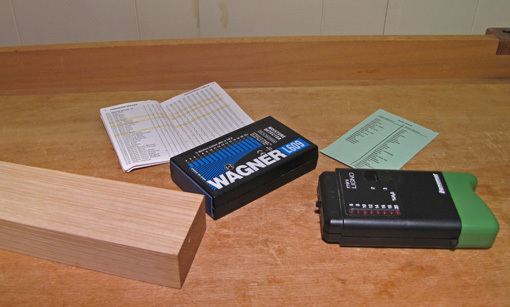 I recently bought some white ash which measured 13-15% MC with the Wagner pinless meter using the correction table. This seemed oddly high for wood that was kiln dried and stored indoors. I brought the wood to my shop, stickered it, and after a couple of weeks, the apparent MC decreased very little. After over two months, it was reading only 12%. Other ash that had been in my shop for a long time was reading about 9%, about what I would expect in the ambient humidity. So, what’s going on? As I suspected, the recently acquired ash is just denser than the average value for ash used for the Wagner tables. How do I know? Well, two months ought to be plenty of time for the wood to equilibrate and it did not change much over that time. Furthermore, the pin meter, which is unaffected by wood density, verified that this wood was now about the same MC as the other wood in my shop, and there was no gradient through the thickness of a fresh crosscut. Thus, we have two easy ways of dealing with the density issue affecting pinless meters: time and a pin meter. Next: We’ll distill all of these technicalities into practical options for wood management. Thanks for writing this blog. I think I have now read every post on here. I am building a tool cabinet roughly based on your Practical Tool Cabinet articles (imitation is the greatest form of flattery, right?). I have learned a great deal from what you have written. I have a question regarding that project, if you don’t mind me getting off topic from moisture meters (the comments are closed for the tool cabinet). Do you (read: should I) worry about your cabinet toppling over? With something so shallow, do you anchor it in place against the wall? My cabinet is secured to the 2×4 base frame with a large screw going through the floor of the case near the back of each corner. The screws go into the front-to-back rails of the 2×4 frame. When loaded with tools, it is not at all tippy, even with the doors opened straight out at 90° to the front. The total depth of the closed cabinet, including the doors, is just under 14 1/2″. If I were to do it over, which I will not, I’d probably make it a little deeper. If I can be of help as you are building it, please don’t hesitate to send me an email. Nice article. I have also shopped for moisture meters but have never pulled the trigger. Priorities keep my hard-earned ww cash going elsewhere. Wouldn’t it be sufficient for most woodworkers to simply weigh a sample board once each week or so, and keep a simple log to determine if that board has lost moisture? When it no longer looses weight, it reaches equilibrium, correct? Yea, I guess that could be done. Let’s say you had an 8 foot board of 9″ wide 4/4 cherry, walnut, etc. It would weigh 35-40 pounds. A 1% change in weight would be about 6 ounces. So you would need a pretty accurate scale. If you have the patience to do a lot of weighing, and the humidity was fairly stable in your shop to get a good endpoint, I guess it could work. Great furniture was made before moisture meters existed (and without scales), so patience and experience can deal with the whole issue. It’s just that moisture meters make things more convenient and reliable. As I emphasize in the next post, the bottom line is to watch the wood.